Thank you thank you thank you to our supporters and community! Our spring concert season was a great success. BBR donated all our ticket sales and audience donations to LGBT Asylum Task Force and to a new handbell choir at the Melrose Highlands Congregational Church. In our season of giving back we are most appreciative to your loyalty and happy to support these organizations! 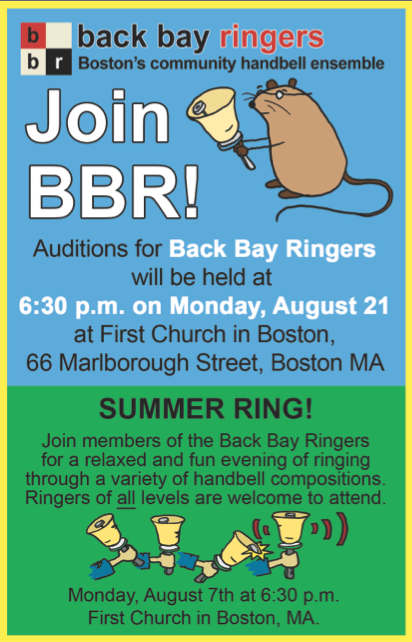 If you are interested in auditioning with BBR for our 2017-18 seasons, please visit our website at: www.backbayringers.org/auditions. Have a great summer! And stay tuned for next month’s announcement of our Winter 2017 Season!